This chapter will continue my analysis of interaction between football supporters and the police. 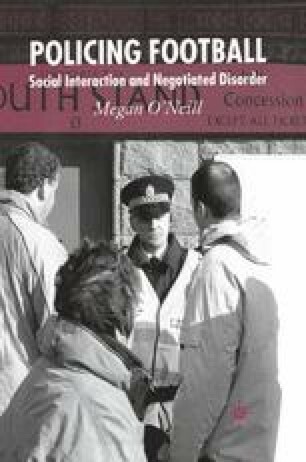 The previous two chapters considered interaction with uniformed police constables, Mobile Support Unit officers, and the football spotters. This chapter will also examine interaction at football matches, but will focus on the senior police officers. I have included sergeants in this category as well as inspectors, chief inspectors, superintendents and chief superintendents. The police do not normally consider sergeants as senior officers, but I have included them here because, as I will demonstrate later, they have a degree of control and responsibility beyond that of the constables. They are supervisors of other PCs as well as police officers themselves so their interactions with supporters are different.